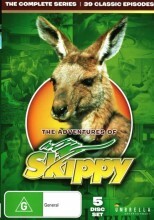 The Adventures of Skippy Complete Series DVD from DVDLand. Since 1967 Australia's most famous Kangaroo, Skippy, has been a worldwide favourite. The original series has been seen in nearly every country in the world since then and she's back in The Adventures of Skippy. Sonny Hammond (Andrew Clarke - Sword of Honour, ANZACS) has grown up and, like his father before him, is a Park Ranger and co-owner of Habitat - a small animal park on the river behind Surfers Paradise. He's also a widower with two twins, Louise (Kate McNeil) and Jerry (Simon James). Rescued from the aftermath of a hit-and-run accident Skippy, the beloved 4th member of the Hammond household, grew up with Louise and Jerry. Teaming with the Hammonds are Thelma Woods (Moya O'Sullivan - Playing Beatie Bow), the other owner of Habitat, and the 27-year-old vet, Kate Burges (Fiona Shannon), who cares for the park's wild animals. Join them as they team up to foil the likes of animal smugglers, repellant rustlers, and even runaway convicts in this complete collection, featuring all 39 episodes. 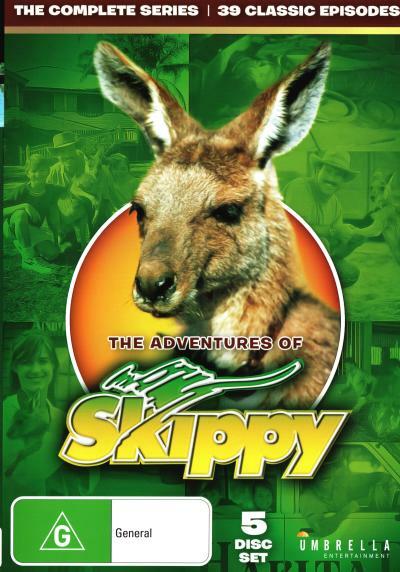 Click the button below to add the The Adventures Of Skippy - Complete Series to your wish list.